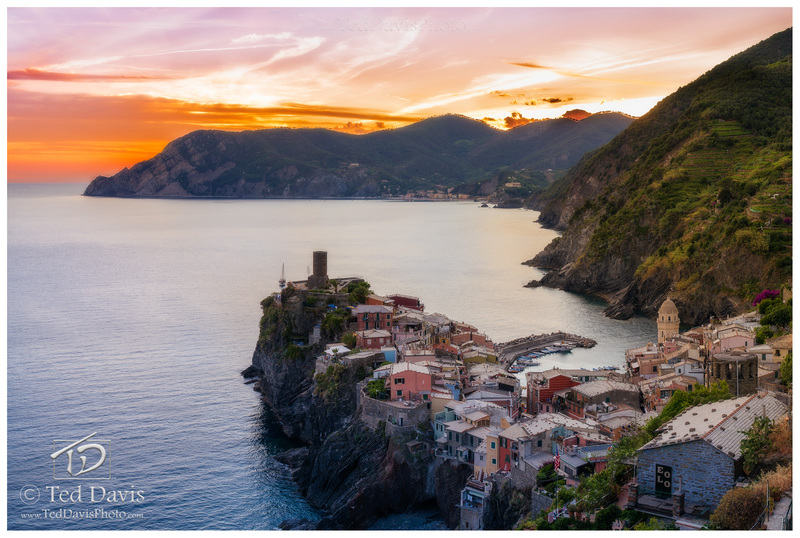 The five villages of Cinque Terre are some of the most beautiful fishing hamlets in the world. With steep hills dropping hundreds of feet in to the Mediterranean Sea, the villages cling to the hills and are built level by level, connected by small alleyways and winding stairs. Vernazza is one of the most picturesque of the villages and is especially close to my heart as it was the first village I visited years ago when I was backpacking through Italy. On my previous attempts to capture this shot, the sunset was less than dramatic and after leaving Cinque Terre I was disappointed that I hadn’t gotten the image I was desperately searching for. Then an opportunity arose for me to re-visit Vernazza during my travels. Two delayed trains and much aggravation later, I was once again in position to capture the image. As the sun dropped below the hills in the distance, the sky absolutely lit up. With clouds tightly hugging the mountains I had a true glimpse of what makes this part of the world so absolutely splendid. Photo © copyright by Ted Davis.